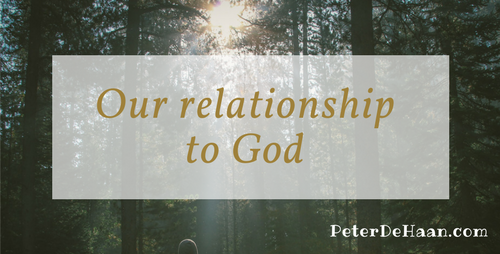 In recent reflections, we have considered eight word pictures to give us insight into our relationship with God. While none provides a complete picture, each does offer a glimpse into one facet of who God is. God is a Potter and we are clay: He is molding us into his plan for us. God is a Vine and we are branches: He is nourishing us, allowing us to grow and bear fruit. God is a Hen and we are his baby chicks: He gathers us beneath his wings to protect us and keep us safe from danger. God is the Shepherd and we are his sheep: He watches us, protects us, and rescues us when we get into trouble. God is our Master and we are servants: He gives us opportunities to serve and honor him. God is our Father and we are his children: He loves us, died for us, and will give us an inheritance. God is our Friend: He talks to us, walks with us, and we hang out. God is our Lover: He desires spiritual intimacy and ecstasy with us. Putting all of these together, we can begin to get a sense of who God is and our relationship too him.